In a growing service-based economy, every business needs to make the buying experience enjoyable, both prior and after purchase. To do this, employees need to be able to access customer and product information at any stage of the buying cycle. This is where workforce optimization comes in. 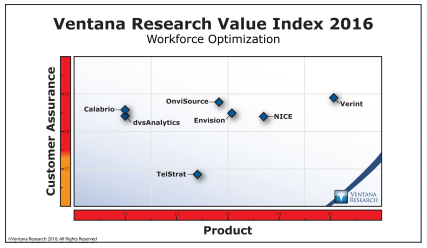 The Ventana Research Value Index: Workforce Optimization in 2016 ranks software vendors that provide workforce optimization tools, so businesses can find and use the tools that best fit their needs. Technology vendors assessed in the 2016 Value Index for Workforce Optimization include: Calabrio, dvsAnalytics, Envision, NICE, OnviSource, TelStrat, and Verint.